When it comes to money, it seems like every cause is always asking for something. And I think that they all really do need the money. The problem is that if I gave to every cause, I’d be sitting on the sidewalk without a roof over my head, or I’d be eating Ramen every meal or, or, you get the picture. But there are other ways to give! Time is a big one, and in college I made blankets for Project Linus. But this weekend I donated in a different way. 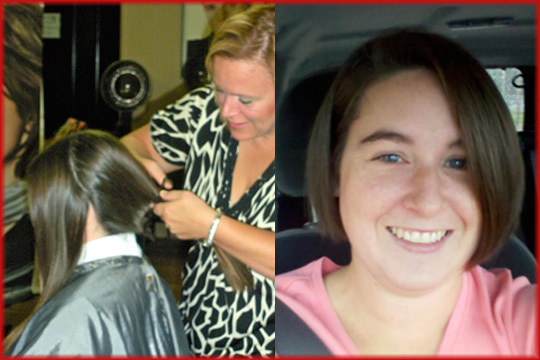 This weekend I donated my hair to Locks of Love. There was about 10.5 inches cut off. I can’t stop playing with my hair now, but I feel privileged to have been able to give something of mine which can bring a smile to a child’s face. Thank you Kerri for mushing the pictures for me!! Cute! new haircut – even cuter after I read where the hair went. Applause…!!! that is a wonderful thing to do! Bravo!! That is so cool! Good for you! I’m going to try to do this too as soon as my hair grows out enough.